NKT can't help itself. So it attacks others, especially Tibetans. NKT claims it is not a political organization, even though its mission, mechanisms and musings are all political, especially against Tibet. Previous essays here have presented strong evidence against NKT's claims of non-politics. But, NKT remains attached to its false claims. "Some critics of the Western Shugden Society have claimed that its agenda is a political one and that the new book, 'A Great Deception' is a political book. So, is this the case? The answer is, quite simply, 'no'. The reason is that the stated aims of the book are spiritual. Indirectly the book protects ALL schools of Tibetan Buddhism. By exposing the Dalai Lama's plan to create a new school of Buddhism by merging all the schools together, with him as the head, it will avert the destruction of Tibetan Buddhism. (The Dalai Lama's alleged) ban has two main purposes - to divert attention from his failure to obtain any good results for the Tibetan people in terms of Tibetan independence or even autonomy within China, and to weaken the Gelugpa tradition so that he can merge all four schools of Tibetan Buddhism together and guarantee himself religious power as head of this new school. Since his intentions are completely self-serving and worldly, it can be seen that he is not a valid spiritual leader or spiritual guide. The purpose of 'A Great Deception' is...an attempt to uncover corruption at the heart of Tibetan Buddhism. One reason why 'A Great Deception' might be mistaken for a political book is that, in order to highlight the hypocrisy and deception of the Dalai Lama, it investigates his political actions, subsequent failures and the devastating effect that these religiopolitical actions are having on Buddhist practitioners and society at large. ...we can see that Lama Policy continues to have a devastating effect on society. This problem cannot be solved unless the lama himself changes his own attitude. The hope of publishing a book such as 'A Great Deception' is that it will bring pressure to bear on the Dalai Lama to change his disastrous policy. Sadly, being self-serving, this will only happen if his reputation and power are affected. We can see that all the problems of division and disharmony in the Buddhist community these days, whether due to the Dorje Shugden issue or the Karmapa issue, are due to the power and ambitions of one person: the Fourteenth Dalai Lama of Tibet and it is he and he alone who can solve these problems. Let us hope that as public awareness of 'Lama Policy' grows the Dalai Lama will be forced to abandon it in favour of a separation between 'church and state' in Tibetan society. Only this will remove the political pollution in Tibetan Buddhism and enable it to function as a pure path to liberation and enlightenment for all living beings." Clearly, NKT is on a political mission in Tibet. And, NKT is attempting to impose its westernized Shugdenism on Tibetans, who largely fear the Shugden ghost and do not worship NKT's version of Shugden. "In April of this year (1996) I received many strong requests from Tibetans living in India, and some requests from Western people who have connections with Tibetans, to help them achieve freedom of worship for the Dharma Protector Dorje Shugden. I received many letters and much information about the ban on this practice. At the beginning I completely ignored this and I thought I would never involve myself in this Tibetan political problem. On the other hand, I thought that if I became involved in these politics I would be criticized by many people and that even my life may be at risk, but finally I said to myself that I must stop self-cherishing and work for the welfare of these people. First, we organized to publish all the information we had received from India through many different newspapers in the United Kingdom, but no-one would print it. After the third demonstration, I strongly requested the members of the Shugden Supporters Community to stop all political activity immediately. ...in October 1998 we decided to completely stop being involved in this Shugden issue because we realised that in reality this is a Tibetan political problem and not the problem of Buddhism in general or the NKT. We made our decision public at this time – everyone knows the NKT and myself completely stopped being involved in this Shugden issue at all levels. This was my first experience of politics in this life. I pray that this will never happen again in the future. However, my letter upset many Tibetan people and many Western practitioners who regard HH as their root Guru. I would like to apologize sincerely to all of them. You know that not one single student of NKT Dharma Centres in Florida joined the demonstration in Hamilton, NY, and this week the Admin Director of KMC Florida has resigned saying: "Since the beginning of our involvement with the NKT we have been repeatedly told that the NKT was not involved in politics. Now that the NKT has opened up with its political position and begun demonstrating I can no longer be a part of the organization. This complete lack of honesty about the NKT's involvement in Tibetan politics is the reason for my departure." I need help from you to solve the Dorje Shugden problem created by the Dalai Lama. Right now the Dalai Lama is removing the Tibetan Shugden worshipers from the Buddhist community saying that Shugden worshipers are not Buddhist because they worship an evil spirit - Shugden. At the same time he is preparing to remove western Shugden worshipers from the Buddhist community with the same reasons. His aim is to destroy the pure lineage of Je Tsongkhapa´s doctrine. To stop this evil action, as the representative of the Western Shugden Society, I personally will organise demonstrations against the Dalai Lama directly. I requested Kelsang Pema and Kelsang Thubchen to do this job for me and they have accepted. Please help Pema and Thubchen with whatever they need." And thus, NKT embarked on a renewed political mission, spending the last 2 years protesting around the world (something Kelsang Gyatso assured the media and his followers that he would never do again), writing a political booklet entitled the Tibetan Situation Today and generating web sites attacking Tibetan Buddhism, Tibetans and those who left NKT or were banned by NKT. January 2010, NKT will start selling its new political manifesto, A Great Deception. A so-called nun (Kelsang Lachog), ordained by Kelsang Gyatso using standards unlike any tradition of Buddhism, recently presented NKT's politics in a television interview in Australia. NKT's representative claims (falsely) that the Dalai Lama is a dictator, has an extraordinary reputation that puts a spell over the people of this world, is a political leader, is not a Buddhist leader (and none of his 13 predecessors were either) and is unleashing a cultural revolution (a phrase used by the Chinese government to rationalize its overthrow of Tibet and the Dalai Lama in the 1950s; NKT and the Chinese government protest against the Dalai Lama side by side around the world). "This is the official ASA statement about the demonstrations in Sydney and an excerpt from a letter about NKT ordination sent to the Australian Buddhist Councils and the World Buddhist Sangha Council. 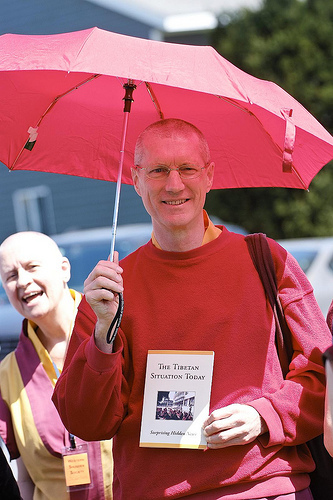 The ASA wishes to express its dismay at the conduct of robed members of the New Kadampa Tradition, Western Shugden Society and associated organizations during the teachings given by HH the Dalai Lama on 11-15 June 2008 at Olympic Stadium, Sydney, Australia. The Dalai Lama's teachings were attended by over 6000 people who came to be inspired by the peaceful and harmonious message of Buddhism. Instead they were met by a large, organized group of protesters dressed in monastic robes shouting slogans. Noisy public demonstrations such as these are not appropriate behaviour for monks or nuns and have brought Buddhism in this country into disrepute. The ASA recognizes there is a difference of opinion with the Dalai Lama on various issues. It is the right of NKT and WSS members to disagree with the Dalai Lama's opinions but their disagreement should be expressed in a peaceful, respectful and reasonable manner. Therefore, in the spirit of Dharma and in accordance with Buddhist principles the ASA would encourage the NKT and WSS protesters to request forgiveness from the Dalai Lama for their behaviour and in future to conduct themselves with humility and restraint. According to our information the robed members of this group have not taken monastic vows as defined by the Vinaya which, as I am sure you know, is the collection of teachings by the Buddha that articulate the moral discipline to be followed by the ordained community. The Sangha is a 2500 year old institution which has always kept the Vinaya rules as its core practice. It is this moral code which is the foundation of Buddhist monasticism and adherence to it is what defines a person as a Buddhist monk or nun. It is the most important thing that we as monastics from different traditions have in common and is what enables us to come together under the auspices of the WBSC and ASA to celebrate our shared commitment to the Three Jewels. Members of the NKT who wear robes do not follow this tradition. They have taken 5 precepts including a vow of celibacy and make 5 additional promises to behave in a manner consistent with Dharma and spiritual practice. This is indeed an admirable and praiseworthy commitment and we do not wish to imply that such practitioners are anything other than sincere and genuine in their devotion to the path. However it must be emphasised that this is not a monastic ordination according to the teachings of Buddha. This definition has nothing in common with the traditionally accepted understanding of ordination and confuses the notion of a Bhikhu or Bhikhuni in the spiritual and conventional sense. From earliest times a 'true Bhikhu' has been one who realised the Dharma. However all Buddhist traditions, while fully understanding this, have always insisted on the necessity for the conventional Sangha to hold Vinaya vows properly received in accordance with the prescribed rituals. The opinion of the ASA is that for NKT members to represent themselves to the public as authentic Buddhist monks and nuns is wrong and misleading. One of the principal aims of the ASA is to help ensure the integrity and good reputation of Buddhism in general and the Sangha community in particular. We ourselves are not sure how to respond to this challenge but have decided to share our concerns with you. If you have some suggestions we would welcome your input. For now we feel that bringing this issue to the attention of the public is the best thing we can do. This is a message to all non-sectarian friends of the Dharma in the world, especially all Tibetans, inside and outside Tibet. His Holiness Tenzin Gyatso, the 14th Dalai Lama, is the embodiment of the compassion of all Buddhas, the golden flower in the land of snows, Tibet, the form of the deity who has appeared in Tibet, the representative of Buddha Shakyamuni, the spiritual leader of all Buddhists in the world, and the great advocate of non-violence. For those who come from the land of snow mountains, to find in His Holiness our sacred source of refuge for this and future lives is truly our inborn nature, like our eyes which give us sight and our innermost heart. However, as it says in The Well-spoken Advice: If you keep striving at faults, There will never be any room for virtues, Like a deluded person with a strainer, You think that the dregs are actually the juice. So, a person who acts with a mistaken understanding of which actions should be undertaken and which should be abandoned is the definition of an evil person. These days, [in Kelsang Gyatso] the demonic cloud of overwhelming arrogance displays itself with a mass of deluded pride, like a bat who thinks he is above the sky. He upholds the lineage of Bhikshu Legpai Karma (Legs Pa'i skar ma), who in ancient times used perverted prayer. This demon with broken commitments, Kelsang Gyatso, burns with the flame of unbearable spite towards the unsurpassed omniscient 14th Dalai Lama, the only staff of life of religious people in Tibet, whose activities and kindness are equal to the sky. Since his own Guru [His Holiness] is without fault, he is throwing away the practice of guru devotion, the eight benefits of following one's spiritual teacher, the eight disadvantages of not following him, and so forth, just as one would cast away a stone. Possessed by a terrible demon, without shame, embarrassment, or modesty, he doesn't have even the slightest care or concern for any of the commitments of the three vows [pratimoksha, bodhicitta, and tantric] which he undertook. He continuously broadcasts blatantly shameless mad pronouncements, attacking with baseless slander His Holiness the Dalai Lama, whose kindness for us, the people of Tibet, has been greater that the Buddhas of the three times. These unimaginable statements which defame the name of His Holiness have created an urgent adverse situation which no Tibetan can tolerate. Therefore, all those connected with Sera Je College, lamas and tulkus, abbots, former executives, senior and junior geshes, together with the leaders of the individual khangtsen [regional houses], all together, in agreement, with one voice, hereby proclaim that on this day, August 22, 1996, Kelsang Gyatso, the one with broken commitments and wrong view, is cast out with the "ritual nine expulsions," and is thereby banished from this place, and the being a part of the rule of our College. This means that we request all of our brothers and sisters, the Tibetan people inside and outside Tibet, to completely sever and relationship with him. Concerning the practice of worshiping divine protectors at this Monastery in particular, the protector who was directed by the previous great masters to advise, command, and look after our Monastery is the Dharma protector Dregpa Chamsing [Dregs Pa lCam Sring). Aside from this protector there has traditionally been no worship of Dolgyal [Dorje Shugden]. These days, we keep in the honored position on the crown of our heads the instructions of our Government, the great Ganden Potrang. Therefore, all sangha who reside here, as evidence of their commitment not to worship the protector Dolgyal, have freely signed such a pledge, and offered it before the clear eye of His Holiness. Beyond that, anyone who is not blind should be able to comprehend this with their ordinary eye of understanding and mind of attachment and aversion; as they say, no one needs a lamp to make things clear in the light of the sun and moon. For the future, we publicly make the strongest request to everyone not to associate the good name of Sera Je Monastery with this holder of broken commitments and wrong view. The audacity and politics of NKT are remarkable, and shameful. Sadly, because introductory classes at NKT typically do not disclose NKT's political mission, many are drawn into NKT for the wrong reasons. Many will spend many hours volunteering for NKT and loan money to NKT. Most, however, will leave NKT after being hurt or recognizing NKT's ulterior motives. Some of these individuals have been subjected to scathing Internet and personal attacks from NKT. "Oh, by the way – It’s true what Geshe Kelsang says. The Dorje Shugden issue is a Tibetan political problem. It arises from the Dalai Lama’s political ambition to be the head of Tibetan Buddhism and has nothing to do with Dharma or religion." NKT argues that the Dalai Lama has ursurped Tibetan leadership. Never mind that he was named Tibet's Dalai Lama, spiritual and political leader like hundreds of years of preceeding Dalai Lamas, when he was a young boy. NKT claims, also falsely, that the Dalai Lama is forcefully attempting to merge all the Tibetan schools of Buddhism into one. The Dalai Lama seeks harmony, not singularity. Even though NKT's defender considers Shugden a political issue, as did NKT's founder Kelsang Gyatso, NKT continues to proclaim it is not political. Never mind that virtually everything NKT says is about Tibetan politics (mostly before the Chinese overthrow of Tibet in the 1950s). NKT's next book and political web sites overflow with discussion of the CIA, nuclear weapons, the war in Iraq, the budget of the Tibetan Government in Exhile in India, a coup in Bhutan, assasination of political leaders, old power struggles in Tibet and claims of its aim to remove politics from Buddhism. Politics rule at NKT, using NKT's westernized product of a controversial spirit in Tibet known as Shugden in order to pretend its mission is a spiritual one. Amazing that NKT's leadership believes this hogwash. Also hogwash is NKT's ongoing claim that it has little to do with WSS (Western Shugden Society). Never mind that Kelsang Gyatso wrote that he is its official representative and that WSS's leadership is comprised of NKT's leadership. NKT recently published yet another example of NKT's fascinatiion with Tibetan political rule. This one concerned the budget of the Tibetan Government in Exile. "The Dalai Lama himself was on the CIA’s payroll from the late 1950s until 1974, reportedly receiving $US15,000 a month ($US180,000 a year). Details of the government-in-exile’s funding today are far from clear. Structurally, it comprises seven departments and several other special offices. There have also been charitable trusts, a publishing company, hotels in India and Nepal, and a handicrafts distribution company in the US and in Australia, all grouped under the government-in-exile’s Department of Finance. The government was involved in running 24 businesses in all, but decided in 2003 that it would withdraw from these because such commercial involvement was not appropriate. Several years ago, I asked the Dalai Lama’s Department of Finance for details of its budget. In response, it claimed then to have annual revenue of about $US22 million, which it spent on various health, education, religious and cultural programs. The biggest item was for politically related expenditure, at $US7 million. The next biggest was administration, which ran to $US4.5 million. Almost $US2 million was allocated to running the government-in-exile’s overseas offices. For all that the government-in-exile claims to do, these sums seemed remarkably low. Many donations are channelled through the New York-based Tibet Fund, set up in 1981 by Tibetan refugees and US citizens. It has grown into a multimillion-dollar organisation that disburses $US3 million each year to its various programs. Part of its funding comes from the US State Department’s Bureau for Refugee Programs." Jokingly, NKT calls this kind of pursuit spiritual.